Web scraping is the process of gathering useful or relational data from specified web pages and converting it into a specified format. Scraped data are usually exported into the database or spreadsheet. The benefits and importance of the process cannot be over-emphasized. This is why it has become a common practice among organizations. The only problem with the process is that it can’t be done manually. For any organization to get any tangible benefit from the process, data has to be scrapped from hundreds of web pages periodically. This is where web scraping android apps come in. The android apps are used to scrape data from numerous pages with so much speed and accuracy. Organizations have the options of using a custom built data extraction tool, a generic data extraction tool, or to hire a third party data scraping company. Hiring an app development company is quite expensive because you are charged based on usage and you definitely need to scrape data regularly. In fact, some organizations scrape data on a daily basis. Right now, making use of generic data scraping tools seems to be the best option. It is very affordable. In fact, some of them are completely free like the one being introduced in this article. A lot of people actually believe that a good number of generic data scraping tools are not effective. Unfortunately, this is not true. What a lot of people do not understand is that every data scraping tool is designed for specific data scraping tasks. If a data extraction tool does not give you good output, it is probably not designed for the task you are using it for. Find another one that is designed for your data extraction need. Here is the Northcutt free link extractor tool. From its name, you should understand that it is meant for extracting links. Don’t expect much from it if you decide to use it for another data extraction task aside link extraction. This tool does not require any download and installation since it is browser-based. All you have to do is to visit the site. There is a space where you can enter the URL of your target site. Once you enter the URL, you just need to click the “Continue” button underneath and you will get your results in less than 10 seconds. The tool will list out all the links in your target website. The provided list of links can be used for search engine optimization (SEO) and web analysis. What will impress you is the simplicity of the tool. Even kids can use it. The speed at which it returns the links is another important feature to mention. You don’t have to download and install it, so it saves your storage space as well as your data. 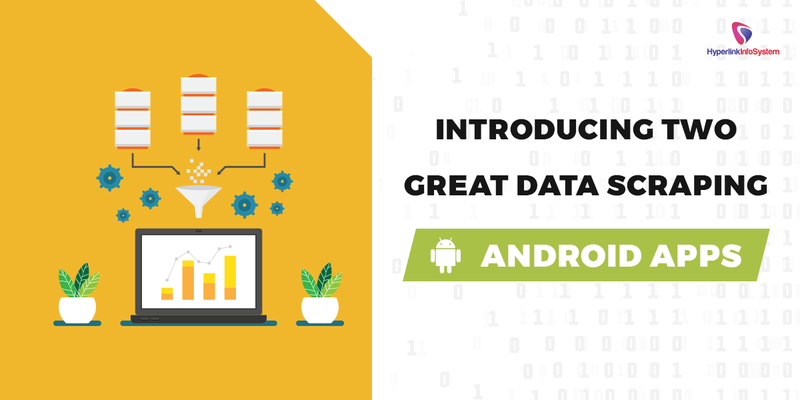 There are several data scraping android apps but Data Toolbar distinguishes itself with efficiency and simplicity. A lot of people require data scraping but only very few people have programming skills. So, all data extraction tools that do not require programming knowledge are usually in high demand. Data Toolbar does not also require programming skill so it is a great choice. This tool is very intuitive and self-explanatory. It is designed to automate the process of web scraping for all browsers. It is so simple that you only need to point to the required data fields and the tool will extract them for you in minutes. It is capable of extracting thousands of data from different types of websites in minutes. As mentioned earlier, it requires no technical skill. You only need to click on all the data field and images that should be scraped one after the other. To select multiple images and data fields, go to the “details” page to add fields one after the other. After that, you should also check "NEXT" page option. That is all. The tool will crawl through the whole website page after page to scrape the required content. After the extraction, the tool will save the data in the SQL script, HTML file, or Excel spreadsheet depending on your choice. There are two versions of the tool – Free version and paid version. Fortunately, the free version of the tool has the same functions with the premium version. They both do not expire, they don’t need any registration, and they don’t allow ads. You must be wondering why people should pay for the premium version if there is no difference between both versions. There is one big difference. The output of the free version is limited to only 100 rows while that of the premium version has no limit. So, you can use the free version for trial and when you are satisfied with the tool, you can upgrade to the premium version with just $24. In terms of supported browser, Data Toolbar comes in two versions. A version supports both Edge and Internet Explorer (both for Windows) while the other version is for both iOS and Android. In terms of quality, both versions produce the same quality of output. Why not try the free version of the data scraping tool since it is free and you have nothing to lose? You can then upgrade to the premium version if you like it. And if you are not satisfied with it, you can simply look for another data extraction app.